Businesses with the best reputations know what their customers want. They should always be the number one priority; after all, without the customer you don’t have a business at all. Remind your employees of this, your customers are the ones paying their wages. The easiest way to make your customer a priority is to put yourself in their shoes; think about what they really want from your service or products. How do they want to feel when they interact with you? If you can get this right, your customers will be your advocates – helping to build your business reputation with little effort. Alongside your customers, your employees are the most important component of your company – however big or small. If your staff don’t feel motivated to do their job properly, your business reputation is sure to be lacking. Treasure your staff and they will work with passion. Passion that translates into happy customers and increased profits. Showing your staff that they are valued is as simple as giving verbal praise when a job is done well or investing in efficient training. The only way to really improve your business reputation is to be constantly managing it. Keep on the lookout for both positive and negative reviews, online and off, and listen to customer feedback so you can adjust your business practices and policies as required – flexibility throughout your organisation is key. When it comes to business critiques, sometimes we don’t like what we hear. We all have different visions of how business should be run, but if your practices are not working for your customers, you either need to target a new audience or adapt to fit those who are paying for your goods and services. If your reputation is lacking, it’s important that you take the time to get to really understand where you need to improve. Online reviews may be a starting point, but more in depth customer feedback can provide detailed insight into why you are not respected as highly as you could be. Alongside customer opinion, reputation can be improved through recognition from other established brands. Awards are a brilliant way to get this recognition but what many companies don’t realise is that they can put themselves forward for entry. You don’t need to wait to be nominated. Just being shortlisted for prestigious awards can boost your reputation and show potential customers that you are well regarded in your field. If you know of any other ways to increase your business repution then please feel free to leave a comment below. Like we mentioned in the article, listening to feedback is vital (even if you are a sole trader or a large multinational corporation) to help you keep on improving. About the author: This article was brought to you by TNT who provides a range of regional and nationwide courier services. 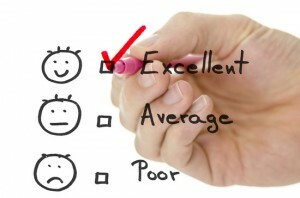 What are your thoughts on customer surveys to gather more feedback? I have occasionally been sent surveys by email — and, at times, contacted by phone — after I have called a company’s customer service number. More often than not I do complete the surveys especially if I have a particularly positive or negative experience to comment on. Sometimes companies will offer an incentive to get more customer participation; a cash sweepstakes for instance. I must say that does give me additional motivation to respond to surveys. I don’t have any figures on which medium will garner a greater result, but I think many companies actually forget at all to gather feedback after supplying a product or service. I’d imagine that getting people on the phone and conducting a quick survey would be the best way to do it, but not everyone likes to get bothered by a phone call after purchasing something! Thanks for this post! I agree that reputation will make of break your business as well as the importance of having a good staff or team. This year I decided to start a business which focuses on music, entertainment and events. Right now were a team of 5 and were not yet registered as a business. I’m leading the group at the moment but I can’t compensate my team on a regular / monthly basis since we are just starting out in this competitive industry. How do I keep my team motivated to build this group into a profitable business that can eventually compensate them properly? If they believe in the business then offering equity in the company would ensure that they get paid well should it become a success. The point is not loose your reputation in the first place. It is difficult to mantain to regain it. The basic principle is to meet your promisses with clients…. Yeah that’s the ideal, but sometimes things happen that are out of your control and the resultant situation needs to be managed in a thoughtful and planned way. Yes, Nik. I agree totally. Don’t lose it in the first place. Engage customers and make them happy. Even when they are wrong. Agreed, although sometimes some people just can’t be pleased! You need to learn how to spot these guys! Thanks for all your comments on the post and I completely agree with your comments. A business should seek to maintain their reputation rather than having to recover it in the first place. So many people forget that social media is a huge part of this. Your posts can keep your reputation positive, or they can really paint your brand in a bad light. Recently I’ve seen examples of both small and larger businesses that just completely lost their opportunity to keep a decent reputation. It’s pretty sad to watch. Thanks Cricket, do you mean blog posts? I would hope that any business that is the large side of small would have controls and plans for authoring content that is of great benefit for the company that they are promoting! Those are valid points. In fact, I would like to add one more point, if I may? I also feel that companies or organizations should do things which are not expected of them, yet beneficial to all. For example, if there are environmental related issues or societal welfare, companies should actively participate or earmark some funds for those activities. These are basically not expected out of the companies or organizations, but when they do it, they are categorized in a totally different league. As always, thanks for your views! Previous post: Are Your WordPress Forms Losing Possible Leads?